Thanks to the generosity of the KZN Floral Art Panel for choosing Robin Hood as their Charity of Choice this year for the exquisite “Flowers Through the Home” show which was hosted in Kloof last month. We partnered with Magic Moments Trust for a completely soul-filling morning, and were joined by an incredible team of community hearts hosting a morning of ‘Tea and Art’ for the 32 Gogos and Mkhulus at Ntshongweni Elderly Daycare. The elderly come to this little tin church ‘daycare’, in the middle of rural Ntshongweni, every day as they have no one at home to care for them, and nothing to do. Here they are served a meal every day by the most amazing ladies, Imedla and Gugu, from Grandmothers Unite. They sit and chat, knit, sew and even do Gogo-Aerobics every Thursday! Always looking for some activity to keep the Gogos stimulated, the Christian Social Services were thrilled when we said we want to bring a morning of art to them! Each Gogo and Mkhulu got to sit with our volunteers and paint their choice of a bag or cushion, as they were served tea and delicious snacks. Then there was great excitement when they were told they could take home the mugs their tea was served in from our #MugsAndMallows2018 campaign! 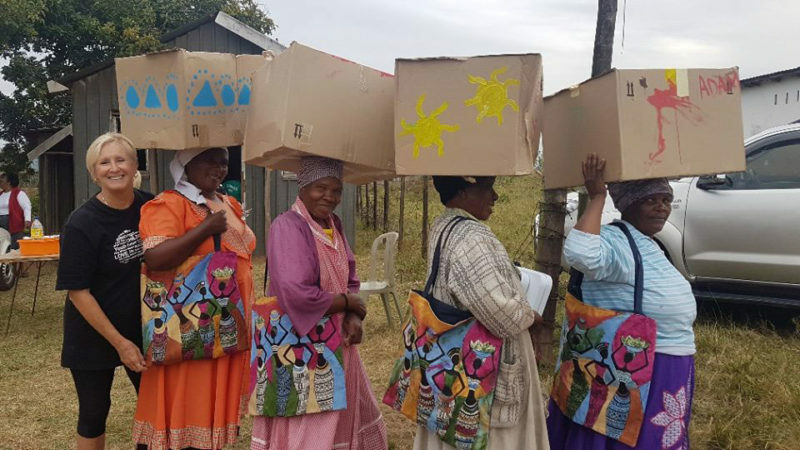 Then FURTHER excitement when each Gogo and Mkulu was gifted with a big box filled with food, generously donated and decorated by Lyn Chivers team from Nedbank (who also joined us on the day). What a special day! To see these Gogos and Mkulus – who have NEVER painted before – so drawn into the arts and loving every minute of the volunteer attention, connection and interaction!